A goal in the second minute and last minute of the first half capped host South Africa’s Bafana Bafana’s dominance over Kenya’s Harambee stars in a friendly match played at Royal Bafokeng Stadium in South Africa on Wednesday evening. 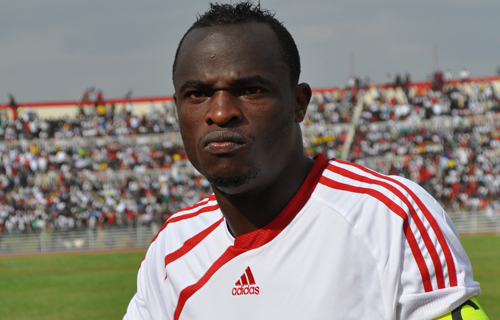 Hardly had any team settled when Leeds United striker David Somma opened the scoring with one minute and forty seconds gone when he flicked past keeper debutant Kenyan keeper Zachary Onyango following a good cross from an overlapping Anele Ngcongca.It was Somma's first international goal that made him excused after missing other two decent chances in the opening exchanges. The early goal seemed to disorganize Kenya’s game plan as they started hitting long hopeful balls perhaps in search of a miraculous Oliech goal but this made them lose possession easily. With 12 minutes gone, Tottenham’s Steven Pienaar tore through the defense and unleashed a pass to Somma who had another go at goal but keeper Onyango kept his shot at bay. It took 21 minutes before Kenya unleashed their first attack.Oliech led the charges but his shot went straight and was well saved by Khune.15 minutes later a good combination of passes from the midfield well marshaled by Jamal Mohammed fed Oliech who beat keeper Khune but his shot flew wide. Another opportunity presented itself when Kenya won a free kick outside the box in the 37th minute but the ball smashed the Bafana Bafana wall. As the game progressed Kenya seemed to have found their footing in the midfield but the defense always looked shaky.Bafana Bafana almost got a gift from Kenya in the 40th minute after a defense mixup but no Bafana Bafana player was there to finish it off. Captain Steven Pienaar led from the front when he struck in the dying minutes of the first half after a corner to ensure his team went to the break two goals up.This also ended his goal drought for the national team since he last scored in 2005. The second half again belonged to Mosimane boys.Coach Zico maded several changes in a bid to re-energise his troops.He brought in Joackins Atudo for Titus Wamalwa, Bob Mugalia for Kevin Omondi,Anthony Kimani for David Gateri and Paul Were for Victor Mugabe but this bore no fruits as the South Africans displayed a better game tactically. With five minutes to the clock an unlucky Dennis Oliech forced another save from Khune for the last chance of the game.The South Africans held on to the win the match 2-0, a welcome result that will help improve their FIFA rankings.For Harambee Stars it was a good experience that allowed blending of youthful and the experienced players.Such matches will go along way in improving our soccer standards. Kenya: Z Onyango,Ha Maloba,Titus Wamalwa,Musa Mohammed,E Ochieng,J Mohammed,Johanna Omollo,K Omondi,David Gateri,D Oliech(C),Victor Mugabe.